This entry was posted in Materials, Sand Cast, Silver and tagged cuff bracelet, navajo, sand cast, sandcast, sterling silver by Native American Jewelry Tips. Bookmark the permalink. I decided I deserved a gift. Going through a very rough time at my job, feeling low. So, I decide, what the heck…I deserve it! 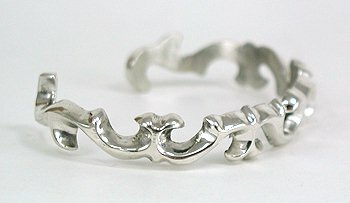 Well, the sand cast jewelry is simply gorgeous. Everyone that sees it can’t take their eyes off of it. Very reasonably priced as well! Anthony Lovato makes some excellent tufta jewelery. I have a Corn Watch Cuff by him that was made in 1991. It is made out of silver and has gold rain drops and ears of corn attached to it. He adorned it two stones of Lapis Luzi. I always get compliments when I wear it. One of my favorite pieces. Best of luck finding that special ring to replace the one you lost. We have some nice sandcast rings in our new store and in our pawn shop.